Discussion in 'General Autism Discussion' started by lilianu, Apr 11, 2019. Calling all adults (18 years and over) with ASD! Would you like to take part in research? 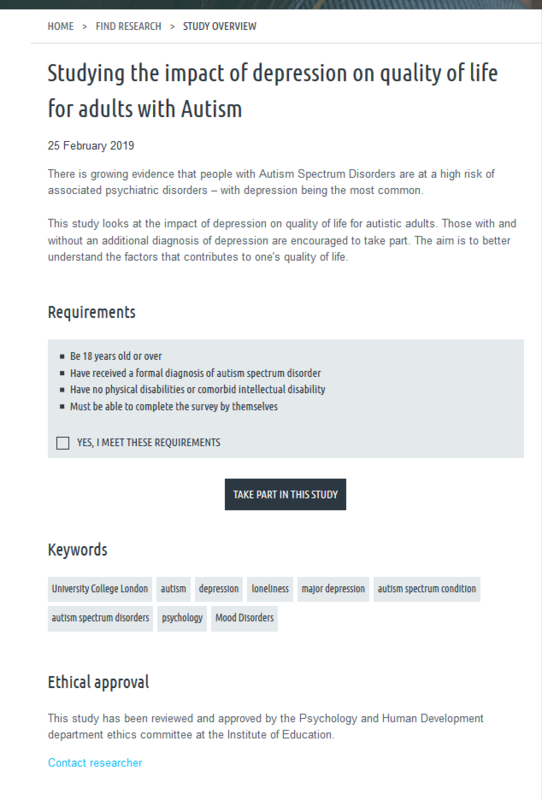 I am a Master’s student and as part of my dissertation project I am conducting a study on the impact of depression on quality of life for autistic adults. This will involve completing an online survey which will take approximately 30 minutes. Those who have an additional diagnosis of depression are encouraged to take part. However, individuals with comorbid intellectual disability or any physical disabilities are not suitable for participation. I'm sorry to say that asking to not have a comorbid intellectual disability is basically impossible. Most Aspies will have some form of Learning Disability. I have a learning disability pertaining to Advanced Math for example, so that would more or less make me unsuitable for your survey. I also fail to see how having a Learning Disability would hinder your results which revolves around Depression at all. Nonetheless, I hope all goes well with it. Sorry, I don't completely agree with that. Since autism is a spectrum disorder, you can get people on the milder end of the spectrum - sometimes called high-functioning autism and Asperger's (although the term is not used anymore). A lot of research studies distinguish between those having an intellectual disability and those who do not since there is a wide range of autistic people. The purpose of this distinction is so that we can try to control for variables that might affect the validity of the study. The participants should be matched on certain aspects so I can potentially generalise the results for that specific population. I said most Aspies will have a Learning Disability, which correlates with what you said; some will have one and others won't. I'm aware that Autism is a Spectrum and that Aspergers/High End Autism exists, no need to patronize me on that, thank you. I'm just trying to say that you're more or less narrowing your audience and that you could get more results in the end. And I still don't see how having a learning disability will affect the results of your Survey. Depression is depression, no matter if it's minor, major, chronic or clinical and having a learning disability won't affect that as they're completely separate and have no relation to one another whatsoever, and I've no idea where you could have possibility gotten this idea that they seem to affect one another. Pardon me for saying so, but isn't that rather obvious? Like studying whether getting poked in the eye with a pointy stick hurts? Regardless, I am sorry to report I only fill out surveys that give you a Manatee stuffed animal as a 'thank you' gesture. Seems to me it would be far more illuminating to take a survey of how autism itself impacts one's quality of life. Otherwise I'd think most people would concur that depression itself negatively impacts lives whether they are Neurodverse or Neurotypical. Would depression compound the daily rigors of so many autistic people having to socially struggle through an often alien and sometimes hostile Neurotypical environment? - Of course! - Just being autistic can be stressful and confusing, particularly when having to socially interact with Neurotypicals. - Depression can be stressful- even lethal. As well all the medications used to fight it. Also it seems like somewhat of a moot point to emphasize filtering out comorbid intellectual disabilities when clinical depression itself can manifest symptoms such as slowed thinking, troubled thinking, difficulties concentrating, making decisions and memory issues. Not to mention that people on the spectrum can have a wide variety of abilities plus or minus when it comes to executive functioning- with or without any perceivable "intellectual disability". Where some may experience such symptoms for long durations of time. Given such considerations, do you really think you need survey results to validate such conclusions? I've battled depression as well and deal with anxiety a bit especially the past year. I sometimes think anxiety and autism go hand in hand. Maybe we should clarify whether or not Intellectual Disability means the type with global impairment and measurable IQ of 70 or less, versus specific cognitive disabilities like dyslexia, dyscalcula, dysgraphia or specific language impairment? Right now I'm not clear on which is intended by the OP. Either way I agree that opening the study up to all participants would be beneficial, even if it complicates things more in terms of controlling for extra variables. You lost me as a participant by requiring me to give you my email address. I won't do that. Just noticed this....I would not give you an electronic signature, either -- not for an online study. I've never seen anyone require an electronic signature for an online research survey. Most don't even ask for your real name (or any name, for that matter), allowing you to participate anonymously. Why do you require these things? Ads that command you have always disturbed me. Oh yeah, I did the survey, forgot to mention that. Commands disturb me, but I also follow them. I won’t be partaking since i’m also physically disabled (cerable pausyish) condition. As the_tortoise said, what is your definition of "intellectual disability?" I have an above average IQ but several learning disabilities. Do you include learning disabilities in your understanding of intellectual disabilities? And, as has also been mentioned, I doubt you will find many autistics without co-morbidities. Add this very major problem in your approach to your demand for a signature and email address, I'd guess cooperation from this forum will be low. We're being flooded with so many requests for participation in poorly thought-out surveys that any desire for cooperation is being undermined. Aren't any of you degree-seekers taught anything about survey design? you can get people on the milder end of the spectrum - sometimes called high-functioning autism and Asperger's (although the term is not used anymore). I really have to say how much I hate the term "mild" or "milder" when talking about ASD. Some may take no issue with it, but the implication to me is that because I am HFA I am "at the milder end" and therefore have no issues and can't complain because my Autism is "mild". What is actually mild is how other people experience my Autism. I (for the most part) mask so hard that people don't see the majority of the crap I deal with. Also the term Asperger's is still used. I was diagnosed with it after the term ASD was supposed to be the preferred term. As the_tortoise said, what is your definition of "intellectual disability?" I have an above average IQ but several learning disabilities. Do you include learning disabilities in your understanding of intellectual disabilities? I am in exactly the same boat. If a government agency wanted to collect information on us this is how it could be done. I would guess that because in some ways we are an expense to them they already are. I am always extremely cautious. Hmmm guy seems a little paranoid to me. I think I laughed for a whole minute!